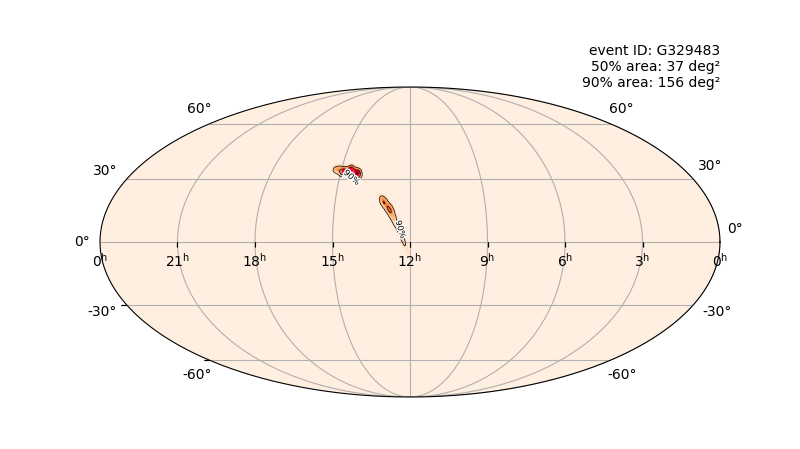 Potential location in the sky of the April 12 black hole candidate event. Less than two weeks after the gravitational wave detectors turned back on, they’ve already seen evidence of two pairs of colliding black holes. Scientists are no longer hoping just to discover gravitational waves, the ripples through space first predicted by Albert Einstein’s theory of general relativity. Since they first detected the waves in 2015, they’ve progressed to using large datasets of the events that produced the waves—typically black holes slamming together—to solve the mysteries of our Universe more generally. The two gravitational wave detectors, LIGO in the U.S. and Virgo in Italy, were shut down during the summer of 2017 to improve their sensitivity. The upgraded detectors were turned back on April 1, the beginning of their third observational run. We’ve been saying that black hole mergers are routine, but the first two weeks of the observing run demonstrate just how routine they’ve become. Though things were quiet for the first week, the second week has already brought a pair of presumed gravitational wave signals, one on Monday and one today. If scientists continue seeing these events at a steady once-per-week rate, “astrophysics will be transformed forever by the end of the observing run,” Vicky Kalogera, director of the Center for Interdisciplinary Exploration and Research in Astrophysics at Northwestern University, told Gizmodo in an email. A pair of detectors in the U.S., called the Laser Interferometer Gravitational Wave Observatories (LIGO), only discovered their first gravitational waves in 2015, the result of a pair of black holes 1.3 billion light-years away slamming together. Since then, the European Virgo experiment has come online, and astronomers have now recorded 10 black hole mergers and one pair of smaller objects, called neutron stars, colliding. You might wonder why we’re already hearing about these collisions, when the results of the past two observing runs were closely guarded secrets. Berry explained that for the first few runs, they wanted to dig into the data and make sure everything behind the results was correct before presenting anything to the public. Now, unless they’re out of the ordinary for some reason, individual collisions of black holes aren’t quite as important as the trends that come with more data. Scientists still have plenty of questions about these massive eruptions of energy. Where in a galaxy are these black hole mergers occurring? Are there second-generation mergers—can two black holes merge, and then merge again with a third black hole, which itself might have once been multiple black holes? Perhaps gathering more statistics will even help scientists hunt for the mysterious dark matter. Why Doesn&apos;t the Black Hole Image Look Like the One From Interstellar?